Provides the closest, most comfortable shave. Consumer Review of Sensor Excel. 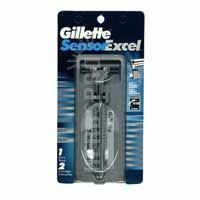 Gillette Sensor Excel is smooth on the face and skin. Nice for a quick shave or when you've got plenty of time. Twin blade system is a good idea and the Sensor Excel blades fit all Sensor Excel handles. Buy in bulk and save a little money. Gillette does not represent the accuracy of any statements or product claims made in this community, nor does it endorse any opinions expressed within these videos. Consumer received reward from expotv.com for this review. This entry was posted in Manual Shaving and tagged EACH, Excel, Gillette, Razors, Sensor.